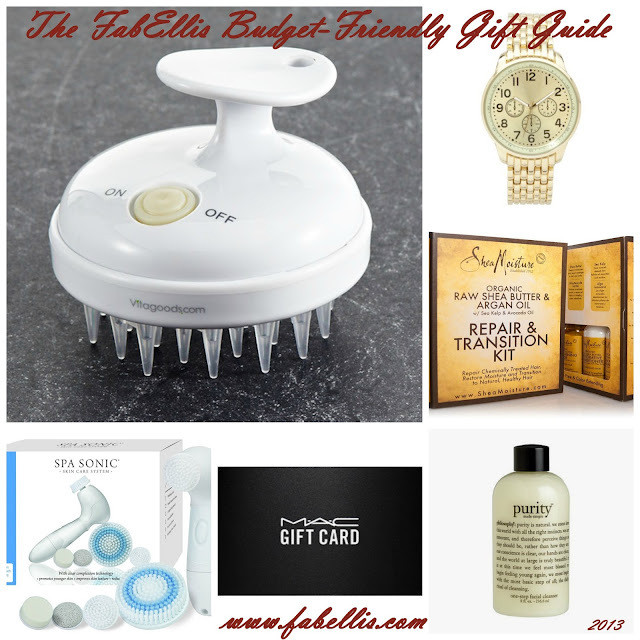 After recently sharing a few items for a gift guide over at Party Over Hair, I realized that I would love to create a budget-friendly gift guide to share. Throughout the year, I have received questions on what I would recommend for skin and hair so I decided to take some of my budget-friendly favorites and put them together to share. The best part about this gift guide is that all of the gifts are under $50 and some can be picked up at your local store. Is there anything here that you would like to receive? What are some of the budget-friendly gifts you have picked up? I so want that Philosophy purity cleanser! that shampoo brush looks awesome!! Me and gift cards are besties. Can never go wrong with those. Have you ever tried the cleanser before? It's A-MA-ZING! Super gentle and even removes eye makeup. I love it! Plus, the Vitagoods brush really helps me cleanse my thick hair. LOL! Let me know if you ever try them and thanks for stopping by! I love it! I really think it cleanses the scalp very well! Thanks for stopping by! You got that right! Plus, I love that companies make e-gift cards now too! She will love that watch! I got it on sale for Buy One, Get One Free a few months ago and I rock that one or the rose gold version daily. It's so pretty! Thanks for stopping by Dre! Merry Christmas! Such a pretty updo, and I cannot wait to see how that translates to your hair! There's something so exciting about this time of year and being able to do something different with our hair and makeup, so I hope you're having a blast with it! I can honestly say that I think I would want ALL of these! The shampoo brush and the Philosphy purity in particular. I LOVE my Philosophy Amazing Grace body wash! i am a huge fan of the pantene naturals line. the co wash is great! and that style looks great, cant wait to try it myself. I love the look. It's simple, yet sophisticated. I'm a fan of Pantene...and my hair is looking thristy. I like the gloss mist best my hair always looks thirsty. I like your look as well it's very trendy.